Finally, a “set it and forget it” reporting solution! Proactively monitor for new hire events in your payroll/HR system, generate new hire reports, and automatically deliver notices of your recent hires to respective local and state authorities in compliance with the Personal Responsibility and Work Opportunity Reconciliation Act. The challenges that our client experienced PRIOR to integrating our New Hire Reporting solution. Perhaps you share some of the same challenges? 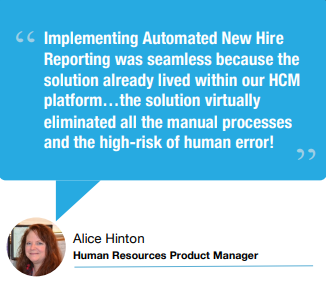 The New Hire Reporting product features and benefits.